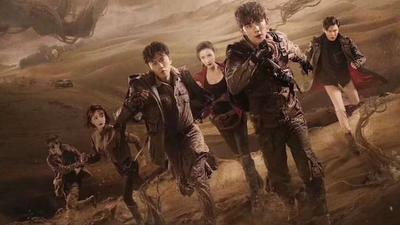 “Tomb of the Sea“《沙海》is a sequel to the popular 2015 series, “The Lost Tomb”, and based on a web novel taking place several years after the events of the first series, though with new actors. It stars Wu Leo (“Nirvana in Fire”) as a loser high school student who is suddenly kidnapped and taken to the desert to help locate a mysterious, forbidden city. Photobucket is undergoing a long maintenance process which has many users frustrated, including me. So hang tight folks, the beautiful pictures in previous posts will come back…. right? RIGHT? I almost forgot this one premieres the same week as HQG! The Lost Tomb ramps up promo activities near premiere date! Is it Li Yi Feng‘s star power that this drama is getting so much promotions from Viki? Even I was surprised at how active they were in advertising for The Lost Tomb. Well, you don’t have to wait any longer because, it’s coming to us this friday! Mark your calendar! Count it down! Yep, they day I’m scheduled for work! All the glorious handsome men will have to wait for moi to come home… And yes, this is a project I plan to upload, among a few others. Being away for 7 days, I guess it is only appropriate to do another batch of entertainment news to catch up with the never-ending showbiz kazooka. As always, you can click on the tag of the drama/actor at the end of the post to see more written related posts of the subject. I was hoping for more horror elements since the novels are not shy of those scenes and descriptions. It’s only the first installment of a 8-part series so maybe they will go darker down the line. Premiering in June! A couple of more weeks to go. Li Yi Feng is the main character but Yang Yang is turning heads for his broody appearance and mysterious vibes! So what do we get? A lot of bromance centering around the two boys and the three older men, because they have to act like father figures sometimes. Aww.